Lezada is such a theme that captures the audience’s attention with sharp homepage layouts and functional online shop design for any business. It is well-suited for retail stores, fashion shops, cosmetics showrooms, and household appliances of any size. Check out our demo to dip into a whole new way of building robust eCommerce-based online shops and businesses. Noticeably, this update comes with 02 new homepage demos, Home Decor and Creative for adorning your shop of domestic decorative ornaments and creative items. Home Decor offers suggestions for product banners and product filter tabs. Creative displays a number of beautiful product categories in a grid layout. Sound fantastic right? Hurry up, check this out. Great creations can take roots from so-called simple & little things. Lezada embraces a minimalist style, with elegant color schemes, charming design and interesting animation. The famous combo of premium plugins, WPBakery drag & drop page builder and Slider Revolution, are kept updated and, as usual, integrated into Lezada. 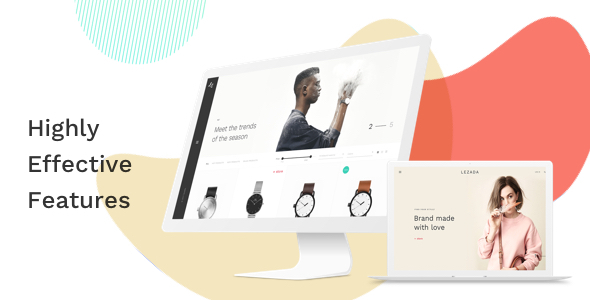 The unlimited choice of colors, 600+ Google fonts, multiple sidebars, custom shortcodes, social media alongside various other features make it one of the most promising WooCommerce theme for online fashion shops and furniture stores. Besides, Lezada provides users with uncountable awesome shopping features like Compare, Quick View, Buying Bundle, ajax live search, off-canvas cart, popup view, etc. Instagram shop is another special thing that you shouldn’t miss out from this theme as well. Above all, all these wonderful things can be ready to use with just one click installation and demo import. Let’s take a tour around! Lezada’s debut with 15 fascinating homepages for different kinds of stores. New homepages with updated taste and style in sync with the latest trends are regularly released via theme updates. We surely can expect more goodies. With each shop layout, users can choose to arrange the position of sidebar and the width of product archives. It’s possible to add widgets for product categories, filters, tags to the sidebar in order to assist the product browse. For each product on your shop, Lezada has distinctive ways to highlight its special attributes. You can choose a basic layout, adjust a full-width page, use sticky details, add sidebar, extra content, variation images, or suggestion buying combo to the product information page. It’s not easy to find similar themes with all these useful shopping features. We keep upgrading this to ensure you have more tools for boosting sales and business growth while using Lezada. Yet more functions can be found upon exploring the theme by yourself. The full-screen special menu is one of the most desirable features in this theme. You can find neatly organized mega menus with a quick popup preview of menu item or add a featured image to it. Everything is just so professionally fashionable. Enhance your customers’ experience by making suggestions on sale combo for better prices, or things that could mix well together for a fashion style. This helps your store close more sales in an active way by offering reasonable combos. Users of ThemeMove themes will definitely find it familiar with these premium plugins that we always build into each item. In case you’re new to it, don’t worry, we have detailed documentation for you. Enjoy the freebies. 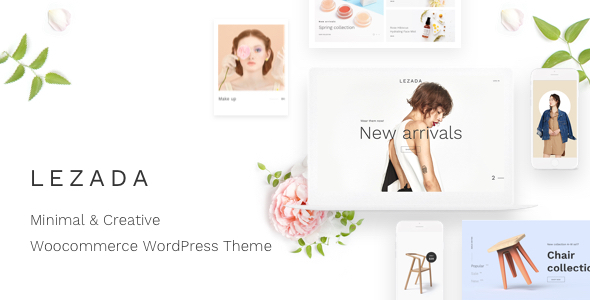 We bring a variety of helpful theme features into Lezada with a view to create a responsive and usable theme for WooCommerce online shops and stores in fashion, cosmetics, furniture and decorative design. It’s never a problem whether you have had prior experience with WordPress or not. Lezada requires no technical or programming knowledge in order to work with it. The site building task is now easier and less time-consuming thanks to the drag and drop editing approach. Save more time for more important things in your list. Search engine optimization is one of ultimate importance to online shops. Your business need a highly optimized theme to gain a good position in the top search results. All elements are customized for optimal display on any kind of devices, whether it is high or low screen resolution. We not only care about optimizing the theme for desktop sites, we pay special attention to enhance mobile user experience. After downloading the theme package, users can easily install the theme with just a few clicks. Demo import only takes 1 click to finish. Whenever you need help, don’t hesitate to contact us. We are ready to tackle any issues you have with site customization. It’s not just about creating an online store and show all your products to the audiences. It takes classy design and remarkable features to help your shop steal the spotlight. This theme is Gutenberg ready and is tested on WordPress 5.0 to make sure the best performance can be brought about. Trending : Become the trend setter with full-width sliders, fashion shops & Instagram feeds. Perfumes: Display responsive product carousels, banners, countdown, filtered product tabs & beauty blogs. Furniture: Present unique furniture pieces with full-width sliders, product banners, single products & countdown. Cosmetics: Full-screen sliders, product collections with banners, testimonials, product carousels with load more button, Instagram feeds. Essentials: Essential wears shown in full-width sliders, product categories, countdown, filtered product tab & Instagram feeds. Concepts: Large sliders with Lazy load, product category banners, Instagram feeds. Shoppable Images: Build an interactive shop with full-width sliders, product items, popup video background, shoppable tags & Instagram feeds. My Collections: Showcase beautiful collections with premade product category banners, countdown and blog previews. Creative Express designing creativity with style using grid product category banners. Accessories: Build a collections of products based on categories using simple banner shortcodes or premade elements. Wearables: Create a powerful shop for selling wearables, which features full-width sliders, product filters and off-canvas mega menu. Smart Designs: Full-width sliders with Parallax effect, product category grid, countdown, Instagram feed. Special: Product grid contents with large banners and parallax background effect. Instagram Shop: Build up an engaging Instagram shop with shoppable images imported from your Instagram account. Fashion: Display responsive product carousels, banners, countdown, filtered product tabs & beauty blogs. Home Decor: Interior and designing single banners & product category carousels. Look Book: Combine extra-large full-screen banners to make a distinctive collection. More impressive homepage designs are in the making now. Stay tuned for more. 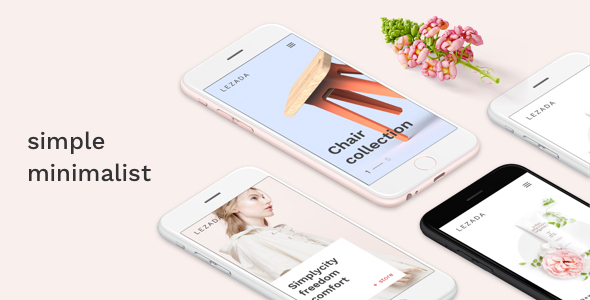 Lezada is compatible with WooCommerce 3.5 and integrated with many outstanding shopping features that would take your business to a higher level. Font Awesome Pro – the unique source of magnificent icons, tools and styles for your creative projects. WPBakery Page Builder (Visual Composer) Clipboard – allows you to copy/cut and paste single content elements or stack of content elements across pages without ever leaving WPBakery Page Builder (back-end) interface! Sites are mobile ready and compatible across all kinds of web browsers: Chrome, Safari, FireFox, Opera, etc. You can create beautiful sliders from our templates or easily build new ones with Revolution Slider plugin. Responsive mega menus can be customized and new items can be added unlimitedly. Retina background images are fully optimized for better SEO effects and faster loading speed. Lifetime updates are guaranteed upon purchasing this theme with scheduled delivery. Dedicated support from customer service team with professional advice and solutions. Just a few clicks to install the theme file and get everything started with demo import. Users are able to access to our online knowledge base for help or send us a ticket from help forum.